People who claim that they hate tequila have had only bad cheap tequila. Cazadores is what you should buy if you want a cheap (inexpensive) tequila that won’t send everyone running from the room when you open it. Cazadores is true tequila. Meaning: it’s made from 100% Blue Agave. And, as this is a Blanco/Silver tequila, it meets my requirement of: Unaged = the Real Deal. Oh, and note the bottle! No silly little jug to raise the price unnecessarily! I am very particular when it comes to tequila. I’ve been sipping, swilling, slamming, shooting, and mixing the stuff for around 20 years. I’ve had my fair share of good and bad tequila. I am really NOT a fan of Jose Cuervo, Casa Noble, and 1800. As much as I dislike those, that’s how much I like Don Julio, Don Eduardo, Tequila 1921, Clase Azul and Cazadores. Yes, I just put a $20 bottle of tequila in the same realm as $40 to $130 tequilas. No, that’s not a mistake or an overstatement. Let’s Not Mince Words: Cazadores Blanco is damn good. And for the price, it’s mixable with no guilt! In its price point, compare Cazadores to Jose Cuervo, Sauza, Hornitos, Corazon, Cabrito, 1800, and Espolon. In my opinion, only Espolon (review here) is worth mentioning in the same breath as Cazadores. (However, Sauza & Hornitos aren’t bad for mixing.) What’s even more surprising is that you can actually sip Cazadores. No, you don’t have to slam it! Personally, I sip it on the rocks with a squeeze of lime. OH! 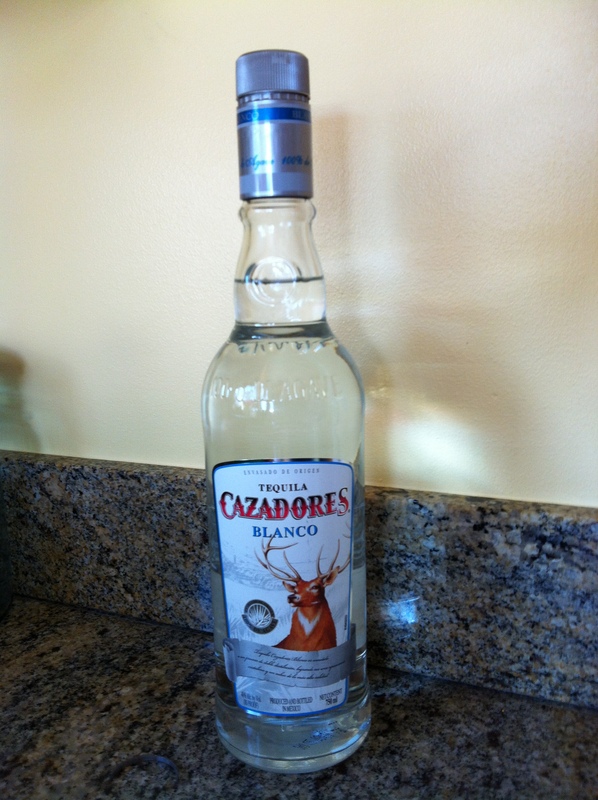 Speaking of Cabrito, go check out a bottle of Cabrito Blanco and compare it to Cazadores Blanco. Note the similarity in bottle shape and label. In my opinion, Cabrito isn’t as good as Cazadores. So: make sure that your bottle has a buck on it, NOT a goat! Cazadores Blanco is damn good. And for the price, it’s mixable with no guilt! But take a moment and consider sipping a tequila. Most folks would NEVER consider sipping it. And that’s because they’ve only had bad tequila. Conversely, Cazadores is good; proving that price is not a true gauge of quality. With Cazadores, astringent notes, a mild minty/citrusy hit, roasted red bell pepper, and cracked black pepper will hit your nose and your palate. None of it overpowering, but the black pepper can be surprising. Cazadores Blanco has the “tequila bite” that most folks expect. Scent and flavor go hand in hand with Cazadores. What you smell is what you taste. Of COURSE Cazadores will work perfectly in Margaritas and Tequila Sunrises. But consider using it in a Bloody Mary instead of vodka. Just dial back the amount of Tabasco and black pepper you use, and dial up the lemon a touch. You won’t regret it. Cazadores Blanco might not be as refined as Clase Azul Plata, nor quite as smooth as Don Julio Blanco, but with a real tequila taste and low price tag, it’s a tequila you can mix without guilt!